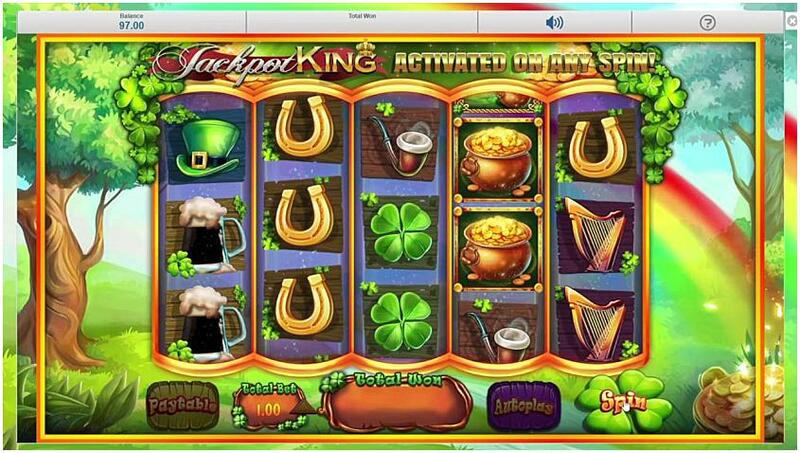 Blueprint Gaming has created an Irish-themed slot game filled with lucky Leprechauns called Slots o Gold. The popular Irish culture comes alive with pots of gold and four-leaf clovers along with rainbows. There are 10 pay lines on the five reels with a theme that ties it together all the way through. Read our full review below. Irish themes, four-leaf clovers and lucky Leprechauns are seen often in the world of free slots games, and Slots O’ Gold, from game-makers Blueprint, is another one to add to the pile. So sit down, relax and spin the reels for a bit of Irish luck. The Irish culture will always be a popular, with its Leprechauns, pots of gold, four-leaf clovers and rainbows in the sky, and Slots O’ Gold is aiming to be as big a hit as all the others on the market. It's set in the tranquil green-filled fields of Ireland, complete with a bold and bright rainbow and a flowing stream running gently under the reels. The five-reel, ten-payline slot is framed beautifully by overflowing pots of gold and some four-leaf clovers for a touch of extra luck. Gameplay is simple, as it is in most of these types of games. Choose your bet, and then select to spin manually using the clover-shaped spin button, or go for auto-play and sit back and relax. As with many of these modern slots games, the symbols are themed to tie in with the background, and Slots O' Gold is no different. Look out for pipes, colourful toad stools, horse shoes, harps and pints of Guinness, alongside gleaming green Leprechaun hats, four-leaf clovers and pots of gold. If you're looking for a little more action, Blueprint has also released Slots o Gold Megaways, which offers up to 15 625 ways to win with each spin of the reels - along with expand wilds and re-spins! Following the standard slots game rules that most regular players will be used to, spin the reels to find the winning combinations of symbols and bag yourself a nice tidy payout. Larger wagers will of course return larger payouts. Remember that there are ten paylines, so lots of opportunities to bank a win. You will find that symbols such as the pipe, harp, mushroom and others appear more frequently. These will offer lower payouts when they line up in a winning combination. However, the Leprechaun's hat and pot of gold will give you an instant win if you line two of them up. As with many slots, there are special symbols to keep your eyes peeled for. These are the ones that will bring you the most in terms of luck and winnings. The beautiful bright rainbow gold symbol will change other symbols randomly when it appears completed uncovered. This might be just what you need to to score that extra-long winning combination and bag a big prize in the process. The wild card in this slot, which is available on PC, mobile and tablet, comes in the form of a Leprechaun. He can replace any of the symbols on the reels, giving you ample opportunity to bag a win, and he is also the keep to activating the Rainbow Respin, where you will get the chance to win big if two or more Leprechauns appear on the reels. So channel the luck of the Irish, pick up the nearest four-leaf clover, sit back and spin the reels and hope that at the end of your rainbow is a shiny and full pot of gold. * Slots O Gold trademark / license is owned by Blueprint Gaming. This site is not endorsed by Blueprint Gaming.